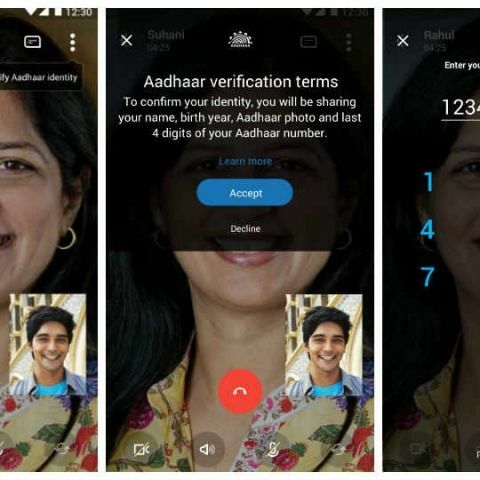 Microsoft has announced that it is adding Aadhaar integration to Skype Lite. The aim is to bring identity verification features to the service. Either party can request Aadhaar verification over video calls made using Skype Lite. To confirm identity, users need to click the ‘Verify Aadhaar identity’ and then enter their 12-digit Aadhaar number and then authenticate it via a one-time password that will be sent via SMS. Once the identity is verified, users can choose to share pre-selected information with the other party in order to confirm identity. Aadhaar verification will be captured as an event within the conversation. Microsoft says that Skype will not store any Aadhaar information and personal information like video and audio conversations are encrypted. In its official blog, the company notes that this feature will help users communicate more securely with each other. “For example, you may wish to make a Skype Lite call to an important business client or government representative – by using Aadhaar, both parties can verify their identity at the beginning of the call to prevent impersonation fraud,” the Microsoft notes. Skype Lite was unveiled at the company’s Future Decoded event back in February 2017. As the name would suggest, it is a lightweight version of the standard Skype app and is built for slower data networks. The app is aimed at low to mid-range Android smartphones and offers a full suite of features like calling, texting and contact management. The app was designed by Microsoft’s India Development Center in Hyderabad and offers support for seven Indian languages including Gujarati, Bengali, Hindi, Marathi, Tamil, Telugu and Urdu. Further, the app also supports Microsoft’s bot framework and UI. It was noted that the company was working with local government and developers to build quality bots for the service. The app is currently only available for Android. Why should link PAN to Aadhaar Card?